Whether or not you have previously undergone chemo or radiotherapy to fight the unexpected disease, you can use virotherapy, mainly represented by Riga virus (briefly called Rigvir®) to sustain the achieved results, to get rid of metastases, or to supplement the conventional treatment. Virotherapy was discovered thanks to Aina Muceniece, a Latvian immunologist, who conducted her research in the middle of 20th century. She managed to find a virus ECHO-7 produced in intestines of babies, which became the basis of Rigvir® vaccine. In the next decade, its healing effect was successfully proved due to Rigvir® treatment of melanoma patients. If you’re looking for more information about alternative medicine in general and virotherapy cancer treatment in particular on the Internet, you can easily find several clinics in the world that provide it. Nevertheless, Latvia has always been the most prominent country for those interested in virotherapy because of the number of reasons. Reason 1. The history of Rigvir® can be traced back to 1950-60s. The experience of the practitioners is passed along from one generation to another. That’s why Latvian oncologists managed to build up the reputation of the world’s most experienced virotherapy experts. Reason 2. Resulting from the above mentioned, Latvia is considered to be an educational hub for all the specialists in the world wishing to adopt virotherapy locally. Yearly Latvia hosts numerous workshops for oncologists from more than 20 countries to teach them the main principles and techniques. Patients can now learn more about Rigvir in South Africa, the UK, the USA, and many other countries. Reason 3. Before your admission to the virotherapy course, your case is thoroughly evaluated by Latvian oncologists. You can be sure that their expertise is equal to the task, and the Chief Oncologist of Latvia is among the definitive decision-makers. It implies individual approach to each patient. Reason 4. Depending on your health condition and personal preferences, you can complete either an inpatient or outpatient therapy course. 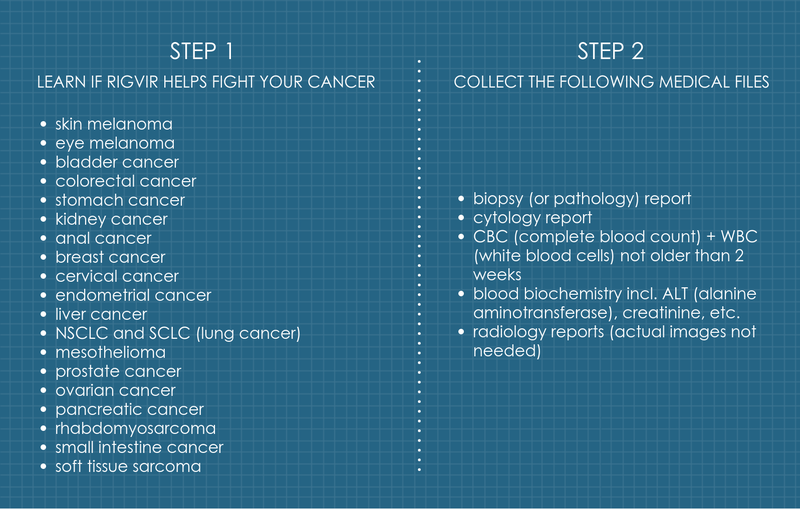 Once you have found your cancer type on the chart, it’s high time to collect the medical files for further evaluation by Latvian oncologists whether you are searching for Rigvir for colon cancer or melanoma. The thing is, some files can be gathered within a couple of days while the others require months to receive. Normally the wait times depend on the country of your residence. The US patients usually manage to gather the documentation within a week while the European ones are likely to spend more time. Biochemistry of blood: ALT, creatinine etc. How Do Other Patients Comment On Their Virotherapy Cancer Treatment? The first clinical trials can be traced back to the 1960s when 415 melanoma patients agreed to test Rigvir® for efficacy. The results received proved that survival rates of these patients have increased. Nevertheless, if you would like to learn about the real-life experience of cancer survivors, watch the videos below. 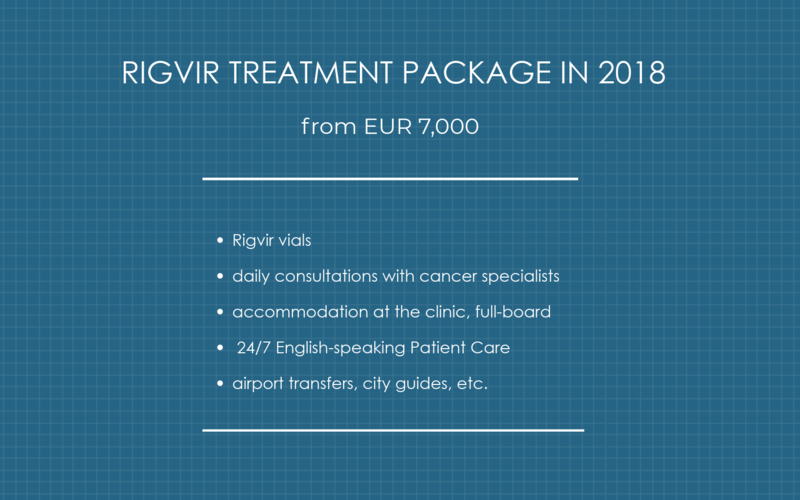 If you would like to know whether Rigvir therapy can help beat your type of cancer, click the button below and we will contact you within 24 hours to clarify all the details.